Hold on to your iPods, Uncle Widget Fans! Bedtime on Mars has finally graced the iTunes Music Store. Bedtime on Mars is available as an entire album for $9.99 or as individual song downloads for $0.99 each. I need your help to spread the word! As a reminder, if you’d like a physical CD, you can purchase from CDBaby. It makes a great baby shower gift or first birthday present. More than a year ago, I published the GTD with Gmail Whitepaper here on space-age wasteland. Some very minor (but very confusing) errors were pointed out and I have revised the document. Here it is. Warren Truit, of kidsmusicthatrocks.blogspot.com recently reviewed the Uncle Widget CD. I’m thrilled with the review and I encourage you to read it here. You’ve all heard of Lulu Self Publishing by now. For a while, I’ve managed to overlook Lulu’s eBooks. Here’s how that is relevant: I’m working on a big liturgical music planning resource. There aren’t many good free ones around (certainly none that will allow community editing like mine) and it’ll be a good way to introduce music ministers around the world to my music. If the second hope is to come true, I need some distribution method. I’ve just recently started turning my sheet music into Lulu eBooks and putting them up for sale for a very modest price. Along with that purchase, you’re entitled to a year of use for a particular church – trust me, it’s a steal. One of the best parts of Lulu is that I had a storefront up in about two and a half minutes. If you’ve got something to publish, I suggest giving it a shot. You’ll get the full review once I’ve actually sold some pieces. The image-link on the right is a shameless plug for the Mass Setting I just completed today. The bingbit store is here: http://lulu.com/bingbit. The GTD with Gmail Whitepaper gets a mention in Wikipedia (Principles of GTD Organization) and an external link. It’s pretty awesome that the author mentioned me by name. I love the smell of The Long Tail. A (quite infrequent) review of Google Analytics showed a big spike in traffic (zero-something) referred from en.wikipedia.org and I thought “now that’s a new referrer.” No wonder my comment spam has gone through the roof lately. Yesterday, I got a status update from CDBaby that my Uncle Widget CD, “Bedtime on Mars” has been added to the store. Until now, I’ve only been able to sell to people I meet on the street. Go buy one! This is also one step closer to Uncle Widget on the iTunes Music Store. After this post, I got an email from a friend asking my opinion on how much information is “safe to reveal” on the Internet. In the above referenced post, I write about how a website is becoming a must-have. But how far is too far? You’ll find that I’m a pretty transparent web-body. Maybe that’s a bad thing. I’ve had my identity stolen once, in early 2002. That’s pretty early when you think about it. That was before the blogosphere was much more than a flame-war over comments by Senator Trent Lott. I’m pretty sure some of my info was lifted out of a compromised e-commerce database. Very little is safe. You probably want to stay away from loosely mentioning home addresses phone numbers, though the information is easy enough to find if you’re looking. I try to draw the line at extremely personal information about my children. If you look at the world through “they’re all out to get me” filters life won’t be too much fun. If you play fast and loose with all aspects of your life, they’ll all be out to get you. Anonymity is possible on the web, but I think it makes you less real. Sometimes it’s hard to give a stranger the benefit of the doubt. Sometimes they deserve it, though. Be careful, but please have fun. Since I spend about 90 minutes a week with a large group of high-school students, I get to spend time picking their brains about the ins and outs of culture and the vast teenage wasteland. Even with myspace being “so wicked awesome” and pervasive, I’d guess that 50% of the high-schoolers I know don’t even use the Internet. At all. This is astounding to me. We’re not talking about nonagenarian Luddites. I’ve been out of high school for nine years now. I am and early adopter (read: freaky nerd boy), but I used the internet all four years. This is the mid-nineties we’re talking about. I’m dumbfounded. I imagine that this is a pretty good representation of the general population (the number of teenagers on the ‘net certainly isn’t any lower than the rest of people). I like numbered observations lately, so here we go. If you don’t have an email address right now, there’s an issue. I know you aren’t reading this if you don’t have an email address though (about 30% of my high-schoolers have email addresses). If you don’t have a website right now, you’re slowly being left behind (100% of my teenagers who use the web have a website – as long as you count their MySpace profile). The transparent nature of the web is dangerously beautiful. Parents need to be concerned. Parents need to visit the websites of their kids. Parents need to build their own websites that are appropriate, responsible, and that their friends and colleagues know about. So do you. Go do it now. You can do it for free. I don’t care if it’s MySpace, Squidoo, Blogger, or WordPress. No, really. Go do it now. There’s a strong chance that every last soul reading this article has a site (of some sort). Print it and give it to your siteless friends. So since Kyle from one red paperclip was sent to me by several different sources and made ABC’s Good Morning America this morning, I figured I’d make a few observations. Part of why this interests me is that one of my “sidejobs” happens to be real estate investing. Kyle’s ultimate goal is to “trade-up” from a paperclip to a house. Kyle will succeed. I’m pretty sure he’s gonna wind up with a house purely through his trades. Kyle was the first. It’s One red paperclip. He will prove the usefulness of bartering through this activity, but onebluepostitpad.typepad.com won’t get nearly the attention, and probably won’t succeed (yes, I know this is very similar to Seth Godin’s article on the million dollar website). Go out and barter, yes. Just remember that Kyle beat you to the blogification of the idea. The “coming soon” banner has been placed at bingbit.com and I’m working on getting the catalog digitized and forming a plan for the e-commerce side of things. bingbit’s first official offering will actually be available from CDBaby in a week or so. Bedtime on Mars by Uncle Widget has been out for a few months now, but distribution has been limited to people I run into on the street. This will allow purchase of the CD from anywhere in the world and the album will make it onto the iTunes Music Store in 2-3 months. 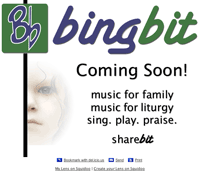 The eventual plan for bingbit is to be an online resource for liturgical music planning, along with a for-profit source of rare and custom music for use in Liturgies. bingbit will also be responsible for publishing and distributing family and children’s entertainment and for creating custom modern soundtracks for video games, presentations, film and advertising.